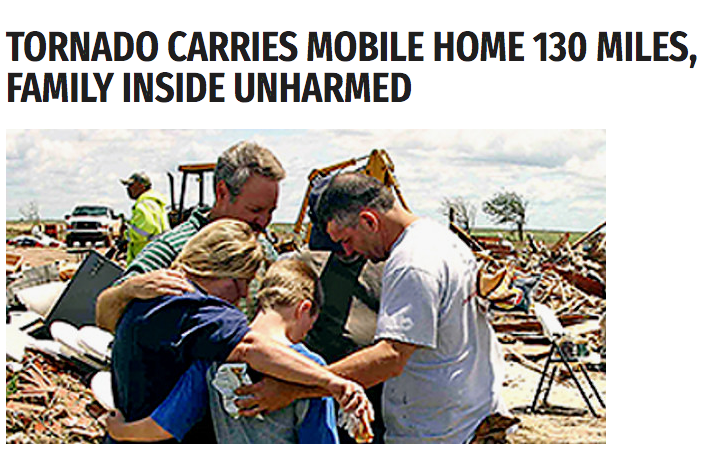 Tornado Carries Mobile Home 130 Miles with Family Inside-Fiction! - Truth or Fiction? Tornado Carries Mobile Home 130 Miles with Family Inside-Fiction! An F4 tornado that swept through Tulsa, Oklahoma, carried a mobile home 130 miles, and five family members inside were remarkably unharmed. A well-known fake news website is behind false reports that a tornado carried a mobile home 130 miles with a family of five safely inside. Wichita| A family from Tulsa, Oklahoma, underwent the scariest experience of their life yesterday, when their mobile home was carried over 130 miles by a tornado, landing in a rural Kansas area. Five members of the same family were inside the building during its “flight”, and all of them have miraculously survived without injuries. 41-year old Dorothy Williams, was at home with her husband, her son, and her two brothers, when their mobile home was lifted off the ground by an F4 tornado. The powerful winds reaching more than 220 miles per hour, carried and shook the mobile home for 4 hours and 18 minutes, sometimes at altitude of more than 1000 feet. After carrying the house across Northern Colorado and Southern Kansas, the tornado finally dropped it on a car, just outside of Wichita, 129.5 miles (208.5 kilometers) away from its point of origin. There have been credible reports of tornados picking up homes with families inside over the years — but none of those homes came anywhere close to traveling 130 miles. A family in Nebraska was inside their home in 2010 when a tornado lifted the home of the ground and dropped it on the foundation facing the wrong way. A similar situation played out in Arkansas in 2015 when a tornado lifted a home from its foundation with a family inside. In both cases, nobody was injured and the tornados dropped the homes almost immediately after lifting them from their foundations. Trump Pressures Argentine President to Cancel Jimmy Carter Award-Unproven! Did Paul Ryan Say That ‘Women Using Birth Control Commit Murder’?